The UN Environment report “Resilient and Resource Efficient Cities” is available now. The report has three main sections: on resilience, on resource efficiency, and on the nexus between the two. For each concept, it explores the state-of-the-art in understanding and implementation – looking at definitions, characteristics, benefits, limitations and practical applications. It then explores the links between the principles, objectives, and initiatives associated with urban resilience and resource efficiency. 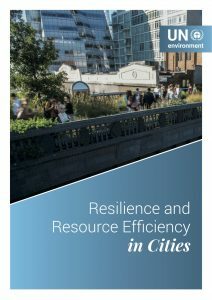 Resilience and Resource Efficiency in Cities – Executive Summary.